Bad idea to claim state disability benefits for a psych injury? Thank you, Jan. You're right that it takes a long time for the government checks to start coming in. It's just that I could still claim them for a few weeks, after the delay ends. I am at present driving a small bus for a social service agency close to home. Because of three near-collisions in the bus yard between buses and people on foot, I took myself off work on 30 days of "stress leave". The company asked that I get a psychologist to sign me off for the leave, and I did so. The question now is: should I also claim State Disability Insurance benefits? If I do so, I fear that would become available information to prospective employers, and ruin or greatly damage my driving career. Also: some "over-eager beaver" in the SDI office could even report me to the DMV, who could demand that I be re-examined - or even suspend my license as a "nut case", or something similar. For that reason, I have held off on filing for SDI benefits. Please give me your thoughts on this question. Thanks very much. Thanks very much, Sue D., G-Town, and Pat M.
Thanks very much , Rainy and Worrywort. 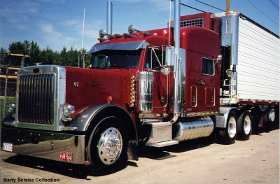 Hi all, I am comfortable driving straight trucks, but for some reason, the big rigs scare me. My fears are specific: getting a red light ticket after the "point of no return" has been reached when the traffic light turns yellow. I also have the fear of truck scales: the cops giving me (and every other driver) the close look, to see what they can write the driver up for. I also have fear of, say, a tire blowing that could cause an accident in which another person (or myself) could be killed or badly injured. The shrinks might call this "social anxiety" or "situational anxiety", or "fear of humiliation" (with cops writing me up), I'm not sure. Surely many of you have had these fears/anxieties as well. Please let me know how you dealt with those thoughts and feelings. Thanks very much. Thanks for the helpful answers, Jessica and Tyler. I just had my DOT physical exam. First thing I noticed was a wide range in costs for the exam - I received quotes ranging from $39 to $139. No joke. The $39 clinic was over 100 miles away, so I took the next lowest price, $65, a half-hour drive away. I was told I had to bring in my previous long form to the exam. It looks like they want to track your condition over the years. The doctor asked me if I had sleep apnea, so I truthfully replied, no, I didn't have it. He then made a speech how many drivers will have sleep apnea and not know it. Fortunately, he didn't push it any further than that. I saw that a driver on another forum also had the sleep apnea question, and the doctor required him to have an overnight sleep apnea test (cost $500) before he would sign him off. The doctor asked me if I took any other meds besides insulin (I am a type 1 diabetic, and carry the Federal Diabetes Exemption). I replied that I took Lisinopril. He then said, "Oh, so you have high blood pressure". I replied (truthfully) that i did not have high blood pressure, that I was prescribed Lisinopril as a kidney protectant medication. This fellow was a chiropractor at a truck stop, so he had only a $50 home blood pressure wrist cuff, not the professional versions found in doctor's offices. The cuff indicated a blood pressure of 155, then on a second test, 138. When I told the guy that my blood pressure was higher because of my nervousness, he replied that truck driving is stressful, and that an examiner would want to see the driver's blood pressure under stressful conditions (!!!!). I was signed off for a year, but this fellow said that he could have only given me 3 months. Then he has the nerve to say he is a "driver's advocate". Bottom line: it looks like the exam is getting more rigorous, and there are more ways to flunk a driver (or only give him 3 months). I would say it's best to throw out your previous exam's long form, and don't volunteer ANYTHING to these characters. Hauling medical hazmat - possible hours of service issues? I would be required to keep a logbook. I would have to leave at 3:30 AM for a 6:00 pickup at the airport, and might not return home until around 3:00 or 4:00 PM. I'm thinking I might run into Hours of Service issues here (more than 11 hours drive time) - assuming I start the log at the time I leave my place. Please let me know your thoughts on these questions. Thanks. I saw a job that I think would be perfect for me (ferrying tractors (no trailers) from point A to point B, and returning to point A in a different tractor). No forced dispatch, work only when you want, etc. The only problem is that they make you work as a contractor, not as an employee. Which means twice the social security tax, no workers' comp insurance, and worst of all, potential liability - (they require that you post a $1,500 cash bond, but I was unable to find out just yet how much worse it could get). The quick and dirty solution is just to find a job with someone else, where the driver is considered an employee. But I was wondering if the contractor status could be challenged somehow, with the State Department of Labor or others. If any of you have thoughts on this situation, please let me know. Thanks. It sounds like you are confusing working contract with working 1099. A contractor is an employee of the company that pays you and this company is required to pay/deduct all payroll taxes just like any other employer. Contractors are usually hourly workers, some call them temps. If you are 1099 you can consider yourself working for yourself and you are the company. Normally, 1099's invoice the company for payment and are responsible for all taxes, insurance, etc. You would normally submit an invoice to the company to be paid. Thank you, Annee. This company advertised on Craigslist, and said that the employment type is "Contract". They pay 50 cents per mile plus fuel surcharge. They give the driver a fuel card, and place an estimated amount on the fuel card necessary to fuel the tractor for the trip. They don't want the driver arriving at the destination with more than 4 inches of fuel in the tanks. The driver is responsible for submitting receipts to the company. One thing you have to remember as I did, used to be a contractor lease OP, not only does the 1099 says what you made for the year but it's what the company says it's paying you and the amount on the 1099 is what the company is reporting to the IRS that it's paying you. So when you file taxes your reportable income on your tax form has to match up to the 1099 on your end and has to match what the company has reported. Your not going to be able to hide what you made for the year if it's done in contractor status. Thank you, Guy. All someone can do is check the accuracy of the income they received that the 1099 shows, to make sure it matches up with what the driver recorded. The one advantage of 1099 income is quite a bit more can be sheltered with the "Solo 401K account" than an employee with the IRA account. For 2015, $18,000 can be contributed to the account, or $24,000 if the person is over age 50. That money can be spent on American Gold Eagles, and many other things. All things considered, it looks like someone is better off as an employee. This is not the case here. The company in question transports trucks but does not have any themselves and this company is contracting drivers for their service since they do not have trucks of their own. So this is simply a casual/pick-up job if you want it? In that case, if you make less than $500 (I think) you don't have to worry about getting a 1099 (or any other documentation)? The one thing you can do with 1099 income is open a self-directed retirement account, such as a "Solo 401K account" or "IRA with LLC". That way, the money in that account doesn't have to sit in a bank, but can be used to purchase precious metals, real estate, and other non-market assets. California residents should go with the "Solo 401K account", because if they have the LLC, California will nail them for the $800 per year "franchise fee". Plus, you can shelter a lot more income with this arrangement then you can with an IRA. Just make a search on this web site for "1099". You'll get topics like this: Employee vs Independent Contractor. But I was wondering if the contractor status could be challenged somehow, with the State Department of Labor or others. The quick and dirty solution is just to find a job with someone else, where the driver is considered an employee. ... because you are and employee! Most trucking "1099" jobs are illegal, unless it's your truck you bring to the party. Good catch there, Guy. Thank you. Yes, the driver is contracted to transport vehicles that are not the employers. Makes sense now. Wow! All my money now, then I'll just pay my income tax in April next year. So, at tax time on April 13 (You get them done at the last second!) you kindly send the IRS a check for about 25-35% of your annual pay, plus "self employment tax" that nobody ever told you about, plus penalties for not getting those quarterly payments in (also, that nobody told you about.) Then you need to calculate those quarterly estimated payments then begin sending them in. Workmen's comp you thought the owner paid for you? Independent contractors are on their own, so don't ever get hurt on the job. You 're paying 100% of your own health insurance ($250/month maybe), right? Unemployment insurance? Hey, you are an indepensent contractor, so you work as you choose. One job stops, quick, get another! Thank you, Errol. It keeps getting worse and worse, doesn't it? As bad as being an employee sounds, it sure beats being a (cough) "independent contractor that is really an employee". Also, don't forget as a self-employed contractor, you will need to make quarterly estimated tax payments to Uncle Sam at the IRS. Thank you, Ralph. And if you're short on your estimates, you might face a penalty, also. The bad news keeps getting worse! Thank you, Errol. Unfortunately, illegal 1099 jobs are all too common. Good idea about talking to the State Department of Labor. DOT might also want to know about situations like these. Thanks also for the link to "Employee vs. Independent Contractor" discussions. I think you maybe a bit confused about a contractor in the trucking industry. You can only work for them.... Yep. They want to make sure you are not working for a competitor also while working for them. Makes perfect business sense... Perfectly legal if you sign the contract. It's called a No Compete Clause. People put this in contracts everyday. No workmans comp insurance and you pay your own social security? Welcome to being a business owner cause that is what a contractor is. You would be moving someone else's freight (a truck). The bond they ask for in a basic damage coverage in case you damage the truck. Again perfectly legal. Thanks for the explanation, Guy. It's a sweet deal for the employer, but not so sweet for the employee/contractor. There's a bunch of guys on this website that have knowledge on 1099 situations. Hopefully they will reply. Of course my advise is worth exactly what you paid for it. And I'm not a lawyer. Thanks again, Jetguy, let's hope that the others who are more familiar with 1099 issues will reply. You're right that it's best to avoid trouble whenever possible. If they hammer the new employee (contractor) with financial liability from the start, my guess is that it won't get any better down the road. The fact that the driver will only work for this carrier, plus the fact that the carrier controls what the driver does, argues that the driver is really an employee rather than a contractor. A lawyer explained this to me- on a business I started- I believe you are right. Challenged somehow? I understand that these rules you stated are IRS rules. So this would be the IRS's responsibility. I see alot of litigation if the IRS did this- could end up in court. When I see problems, I get away from bad situations. Thank you, Jetguy. Maybe it's best to let the IRS know about this situation, and see if they later re-post the ad (on Craigslist) as hiring employee drivers.